Waiting for the heat and humidity to break and for Rainy Season to officially announce itself present. The sky is dark with heavy clouds but has been teasing for weeks. Our part of Congo, south of the equator, is dried up and dusty, having had no rain for the better part of six months now. The air is hazy and brown, whether you’re looking up from the ground, or down from the windows of an airplane as I was a few days ago. There’s not much to look at. 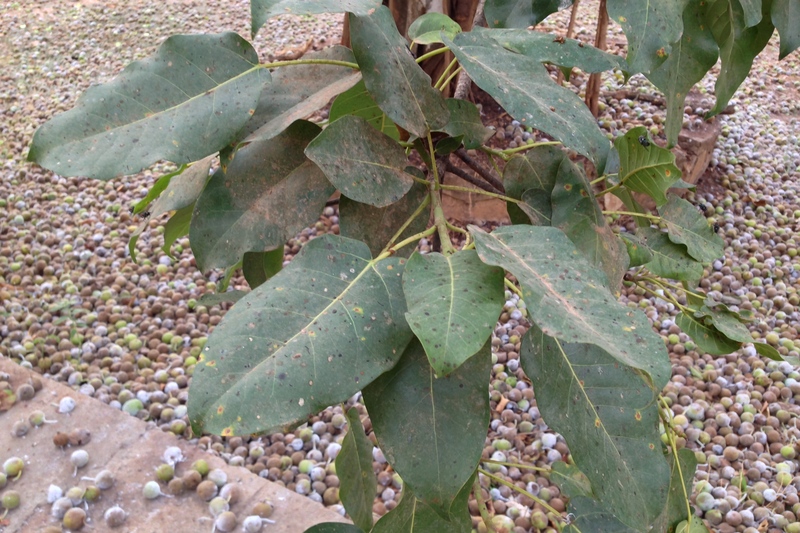 Despite the dryness there are mangoes starting to grow on our tree for the first time ever, a volunteer seedling that was tiny just a few years ago. I haven’t kept close track of when each variety of tropical fruit ripens around here, perhaps the mangoes will be ready shortly after the first rain. I’ll keep you posted. 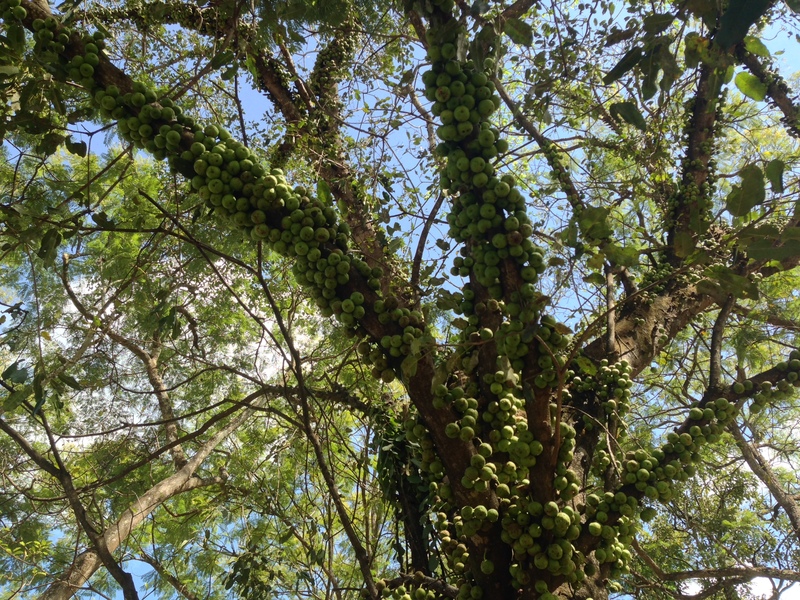 The avocados are also growing, and I hear the jackfruits are coming along again. We can count on papayas and bananas almost year-round. There’s one other fruit that’s ready to go at this particular hot, dusty moment: the fig. Shame is, we can’t eat it. At least, that’s what we’ve been told. There’s a large fig tree just outside our yard, and if I’m sitting outside I can hear the nearly constant plop plop of over-ripe figs hitting the ground. We can’t walk to the canteen or the social club without stepping on them, which immediately go squish under our feet. Tonight the figs are dropping so fast they sound like popcorn. It’s a shower of figs. A harbinger of the coming rainy season, maybe? I had never noticed before. Before the rains come, first it must rain figs. And the smell. It’s a smell I had subconsciously associated with this part of the year from seasons past. 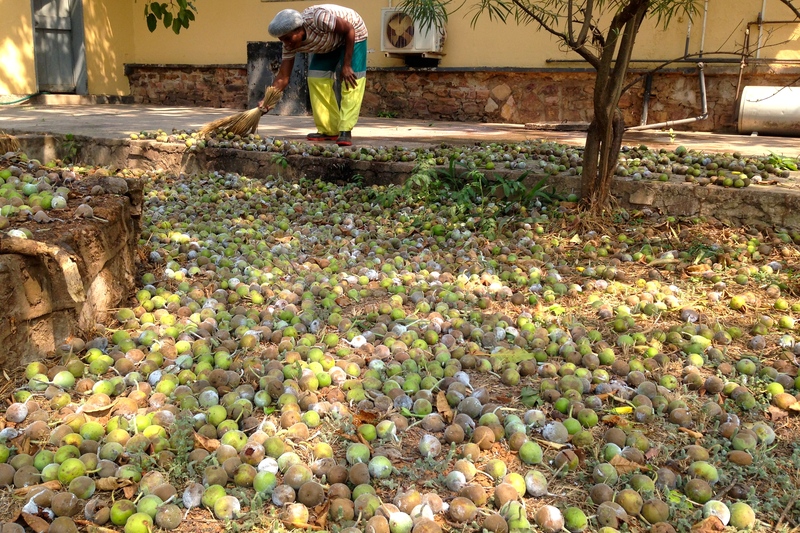 The smell of rotten figs is just as uncomfortable as the heat. They smell offensively heavy, like dirty laundry in a condensing dryer. They attract hordes of flies, and are covered with a fine, white substance that looks like mold or moss, which floats all over our patio and makes us sneeze. None of this stops the monkey from eating them, however. Meanwhile, our vegan neighbors were going to town on the jackfruit after their recent trip to Uganda, finding all kinds of ways to eat it — in smoothies or sushi or salsas, on pizzas, pickled, marinated, raw or cooked. Apparently it makes a nice substitute for shredded pork in carnitas and tacos. While I can’t say I shared the same adoration for the jackfruit when I tried it raw in Uganda, I was pleasantly surprised with several of my neighbor’s recipes and had no ill effects after eating it. Next season, I’ll follow their lead and put more effort into it. So back to this fig, and whether it’s truly inedible or not. Now might not be a good time to find out, since they’re falling off the trees either rotten or dried out. But what if we got to them earlier? I hate to see something locally available and so copious going to waste. This photo was taken back in April — a better time to try them? Any experts out there who can point me in the right direction? From what I can find online, giving these a try is not likely to kill me… “inedible” figs aren’t poisonous, just not very tasty. I would probably attempt cooking or roasting them first. 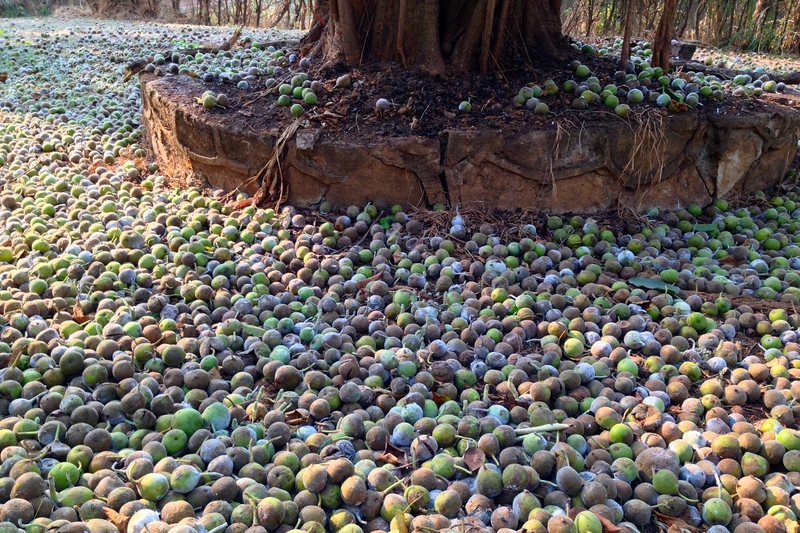 Interesting … enjoyed reading about fig fruit in the Congo … reminded me of my anthropologist friend–Walt Frederickson at Maui CC–and when he would come to my office offering mangos …he would say: “my trees are puking mango fruit”! … and they were delicious! Haha, trees “puking” fruit — an accurate image. It’s sad how they all ripen at the same time, so fast we can’t get to them all, and then a few months later we’re really wishing we still had some. Feast or famine! I find myself collecting recipes for mangos and guavas etc during the “off-season” just to be better prepared when the feast arrives! Your story reminds me of the queen palm in our front yard. At least 4 times a year, it sprouts a huge pod of seeds, each individually covered in an orange jacket. Hundreds of these seeds fall to the ground at once, then the orange jackets start rotting off, attracting ants, bees and flies. Plus a terrible odor, forcing me to go out and pick them up off the ground. I can just imagine the odors around your house right now. But your figs are much larger than our palm tree seeds and can probably cause a headache if you get hit on the head as they fall! Wish I was a botanist to help you determine if they are safe to eat. I just learned on a walk through town recently with a development person that a lot of people have been digging their own wells lately because they’re finding the big ones too crowded, too long of a wait, or broken down from people cutting the pipes to steal them. The hand-dug wells are a problem because they are often very close to latrines, which seep into the groundwater and contaminate everything. Boiling the water is the only solution but do people always do that? 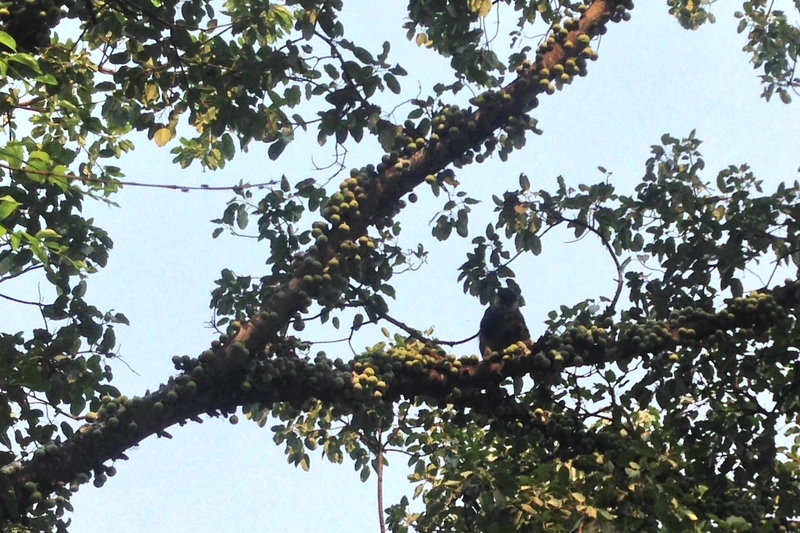 It takes time and lots of charcoal… a business which is booming, by the way, and decimating the forests around here. 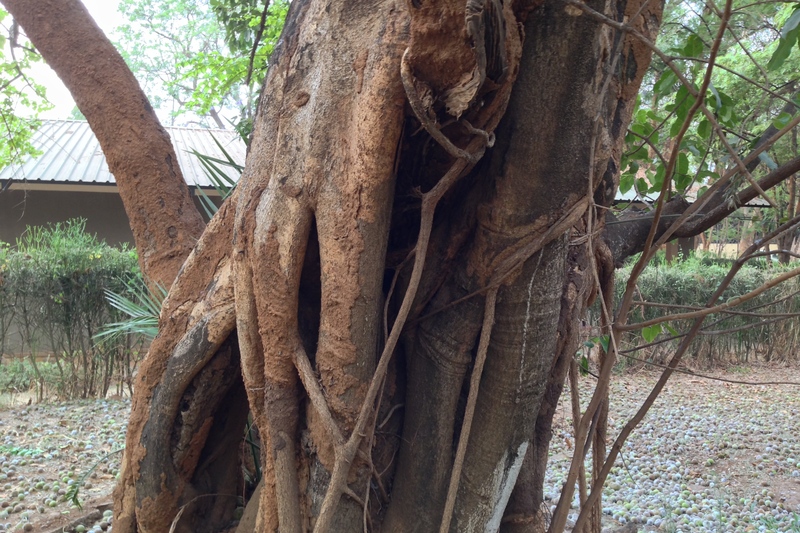 A friend helped me identify this tree… we think it is ficus ovata. It seems to match the photos and geographical distribution per http://www.figweb.org. The description per CRC World Dictionary of Medicinal and Poisonous Plants says: “huge, strangler, crooked, copious white latex, rainfall indicator.” Its traditional uses: “antiviral, antimicrobial; white latex used on soles of feet; root, bark for tetanus convulsions; magic, ritual, protector fetish tree; veterinary medicine,” however they say nothing of the fruit being edible or not. 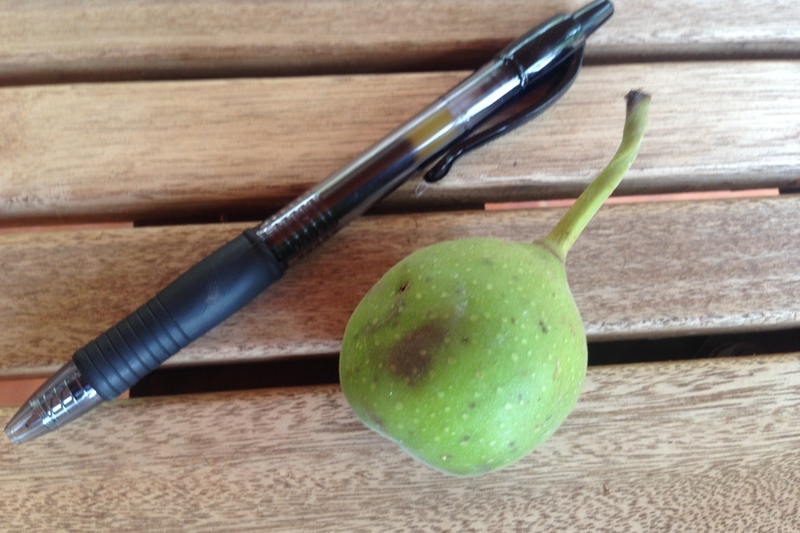 Our guess is that the fruit is inedible because it’s unpollenized — apparently each of the more than 700 fig species has its own species of pollinating wasp! We have wasps around here but maybe not the right kind. My cross-section of the open fruit looks like it’s still full of flowers (which in figs are internal), instead of fruit. This is how it should look, and also makes a fascinating story! 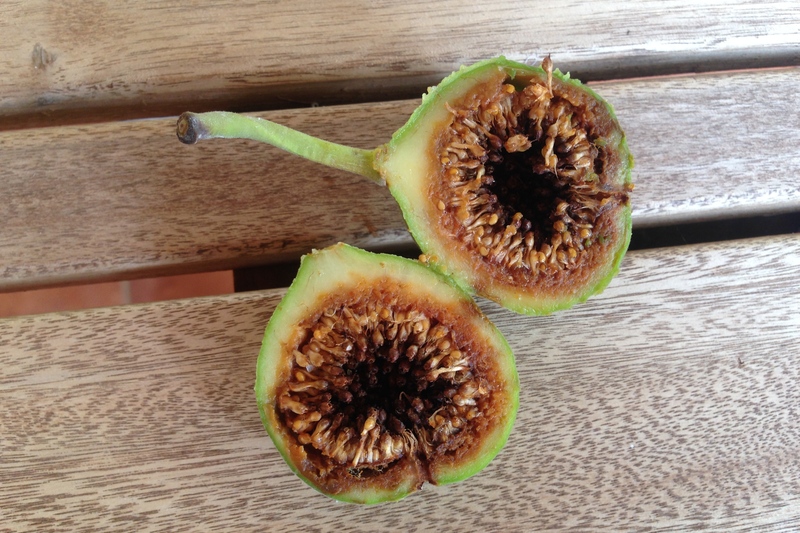 Never knew you were eating dead wasps when you ate figs, now did you?